Adventures in Getting Settled…and Zombies. Have you moved recently? Are you planning to move soon? Are you comfortable where you are and are just reading this post to kill time while your coffee is brewing? Don’t worry peeps. I’ve got you covered. Now that I’m about 3/4 settled in Calgary, I have some very practical learned-from-real-life-experience relocation tips for you. 1. Run from the Undead. Does your new city have a Zombie Survival Race? If so, sign up and run for your life. If not, you’ve clearly moved to the wrong city. Pack everything up right now and try again. Here’s why it’s a good idea. When you’re making new friends, you’ll want to know right off the bat who’s going to leave you in the dust, who’s going to stick with you, and who you’re going to want on your team during the apocalypse. You can take months to figure that out on your own, or you can do it over 5 kilometres in one zombie infested afternoon. You’re also going to totally impress the cute guy in the elevator when you get home covered in mud. When he looks startled by your appearance, just shrug nonchalantly and casually explain, “I was running from zombies.” Because that’s not strange or geeky at all. 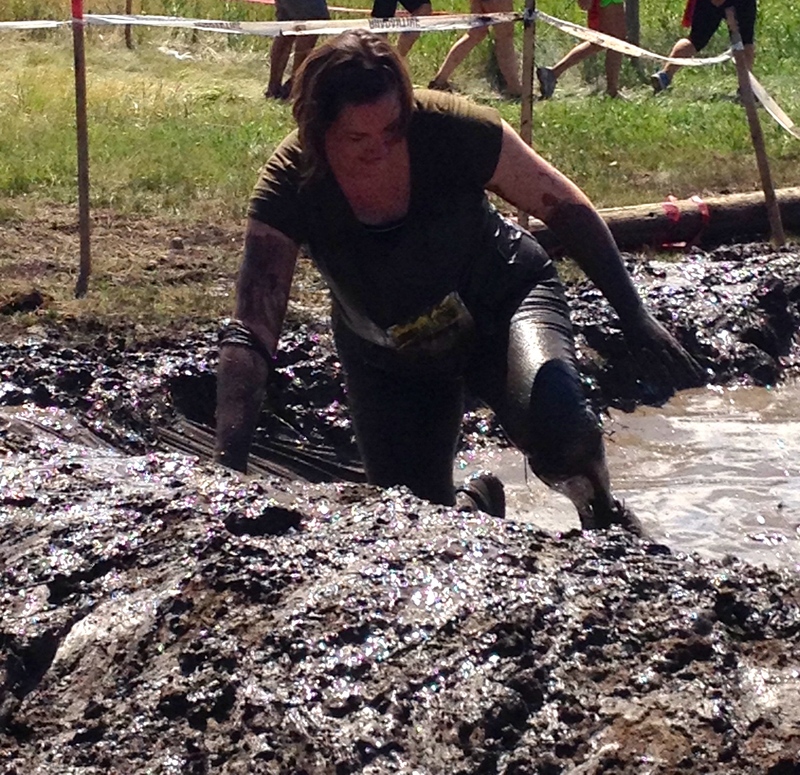 Hopefully zombies are allergic to mud. If so, I’m totally safe. Nobody wants to lug bulky stuff like a toaster, a dish rack, a laundry hamper and a blow dryer home on the bus all at once. And nobody wants to make 4 separate trips to the store and buy them one at a time. And by nobody, I mean me. I don’t want to do those things. As an added bonus, each order comes wrapped in a free feline amusement device. My cat now has more furniture than I do. On the upside, I hear cardboard boxes are making a fashionable comeback. Or so Catticus tells me. Not just about how to survive a zombie apocalypse. You’re also going to need to put some effort into real plans too. Why? Because you’re going to wake up every day and think that you need to do all the things at once. Your to-do list will be 100 pages long, and you won’t know where the right stores are or how to get to them, and instead of making a plan, you’ll become paralyzed with indecision and watch Netflix. 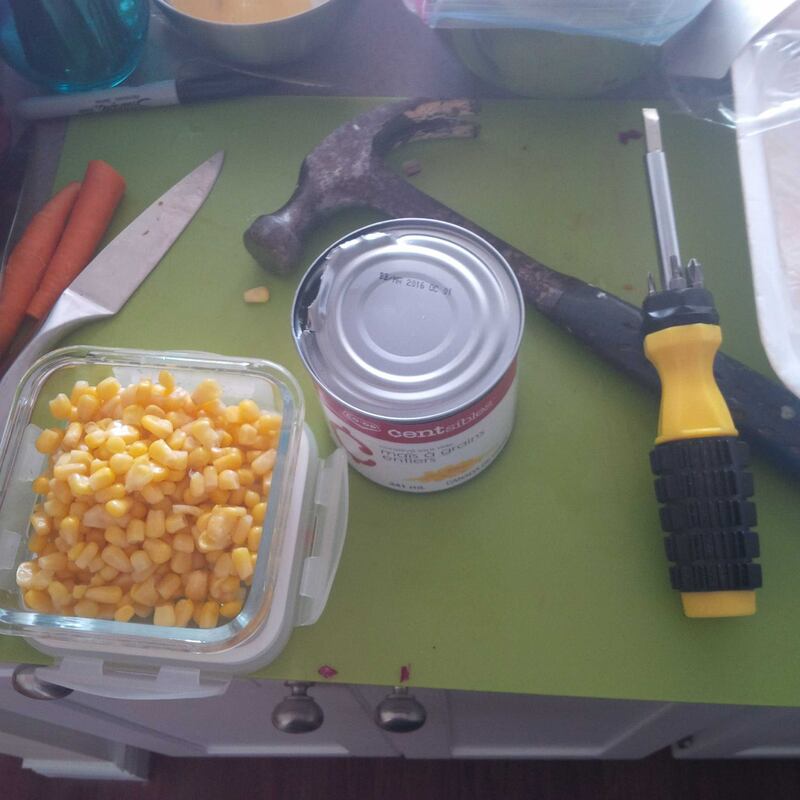 Me vs. Corn – with no can opener to intervene, we’ll just fight it out until one of us needs a bandaid. Also, don’t put up your pictures and decorations yet. Wait until you have all your furniture in order, then figure out where your hideous green ceramic lizard from Mexico will look the most appealing. Haha, just kidding. Hideous green ceramic lizards look great anywhere. Put that little fella up as soon as you move in. Basically, pick one or two things a day to accomplish for your home, and one or two things to accomplish for life. Go outside. Scout out a new park or library or cafe. Talk to real live people in your neighbourhood. Volunteer for something once a week. Buy a can opener. Start making your new city feel like home. Because it’s where you’re going to be living for a long time…at least until the zombies come. Do you have any great re-location tips? Share them in the comments! The other day was a bit hectic, and included fighting with Jason Bateman (in my dream), flooding my kitchen (in real life), baking an entire batch of cookies for the ants (in error), and gardening with the help of my ancient neighbour and his cane (wielded like a sword). You may be asking yourself, “Why didn’t I read about this? Why wasn’t such a day recorded for posterity on this blog that I sometimes read when I have absolutely nothing else to do with my time?” Dear reader, I have no excuse. It just didn’t seem news worthy. However, since it’s been so long since I’ve written, and you’ve been so patient, I’ll tell you all about today’s adventures. I’m pretty sure it’s going to sound like I had a terrible, awful, dreadful day. I really didn’t. Overall, I’m feeling pretty good…but today, the rains came…and when the rains come, they bring trouble. I came home this afternoon to find water dripping out of a leak in my ceiling, an overturned lamp, a shattered light bulb and a completely complacent cat curled up on the sofa, blissfully unaware of the shambles around her. 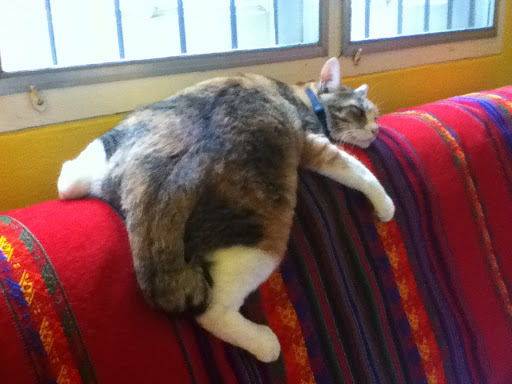 For a feline, she is remarkably un-curious. Not only will curiosity never kill this cat, it won’t even give her so much as a hangnail. I have no interest in the world around me. Eventually, buckets were put in place, landladies were alerted, broken glass was swept away…then the bugs came. Every year, the first heavy rain of the season awakens the flying termites, who noisily swarm the nearest lights. Last year, I still had my mosquito net up, so took refuge under it and waited for the maelstrom to pass. This year, I wasn’t so lucky. Not only was I exposed to the onslaught of fluttery bugs, the floor fan in my room was sucking them in, mashing them up, and blowing an oscillating stream of wings and bug-bodies all over my room. I had high hopes that the cat would at least take care of some of them…but no. Even after one bug flew directly into her face…twice…she looked at me like it was my fault, then sauntered away, completely ignoring the fluttery mayhem around her.